Four legs and total PC control - what more could we need? Anyone hankering after a robotic canine playmate for their lonely Aibo, will be pleased to hear of Japanese company HPI Racing's plan to bless its home market with a new quadripedal 'bot later this year. The 'G-Dog' kit robot, whose price is still a closely guarded secret, will go on sale in July aimed at hobbyist robot fans. 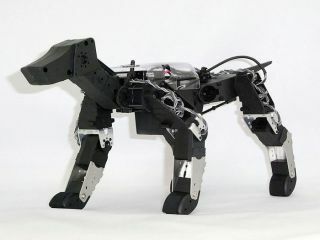 Although there's no information on HPI's website yet, G-Dog appears to be based on the firm's successful bipedal machines. We do know that it will be about 37cm long and 19cm tall, which should make it a match for something like a miniature poodle. Like the other HPI robots, G-Dog will connect to and take orders from a Windows PC.